I'm looking to add three buttons in the admin side of coursepress. 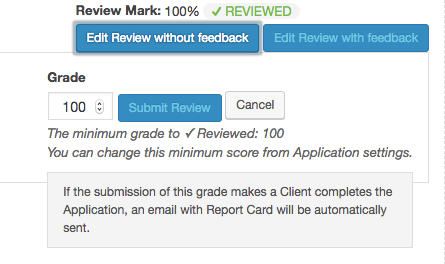 I basically need to add three buttons....one to quickly set the grade as 1, one to set the grade as 50 and one to set the grade as 100. I've already escalated this to our Second Level Support for further investigation. Please keep in mind that if it requires some extended amount of time, they won't be able to further assist and you should consider hiring a developer to custom-make this for you. Me or another colleague of mine will keep you posted here, as soon as we've got some feedback on this. 1: In the wp-content folder, create mu-plugins folder if this already not exist. 3: Upzip the gist file, upload the php file to mu-plugins folder, and you are done! If you have any question regarding this issue, let me know here!